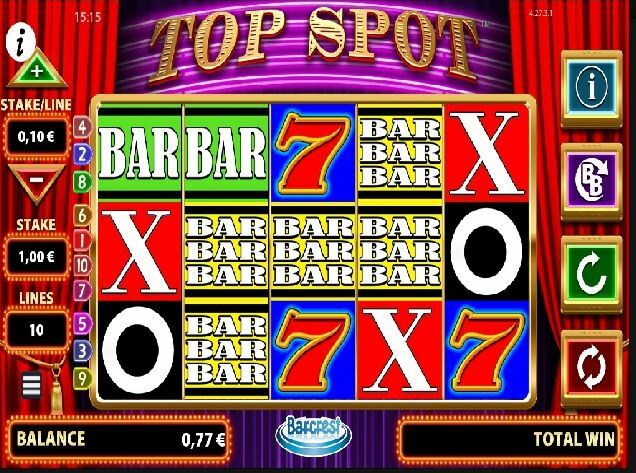 Top Spot video slot is a 5 reels, 3 rows powered by Barcrest and 10 or 20 possible paylines you can keep active. Top Spot is all about the classical theme and style, but as always with Barcrest, it comes with a twist. Symbols that you get to enjoy from is everything from BAR´s in varies of colours, to X and O. But the best part about this game, apart from the clean cut graphics, is the features being offered. One of these features is the Top Spot feature. You have a Top Spot reel in the middle and it is there to give you a chance of maximizing your line win with additional reel symbols. Every time you win, a symbol will trigger the Top Spot.